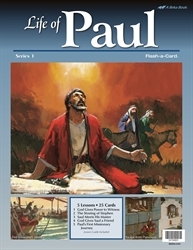 Use these brightly colored, large-size Flash-a-Cards to bring the story of Paul to life. From Jesus’ ascension to the first missionary journey of Paul, these 5 lessons and 25 picture cards will capture the attention of your child. A detailed teacher guide gives you content to teach, prompts to use the pictures, and review questions for each lesson. Fill your child’s heart with the doctrinal truths and applications within the story of Paul.